Albert White Hat Sr., who passed away on June 11, 2013 at the age of 74, was an inspiration to anyone working to preserve or learn Indigenous languages. The Elder was an activist for traditional Lakota ways of living, according to his daughter Emily White Hat. He authored Reading and Writing the Lakota Language, and co-produced the book and CD Lakota Ceremonial Songs. He was entrusted to provide translations for actors who spoke Lakota dialogue in the 1990 movie Dances with Wolves, set in the buffalo days in South Dakota. White Hat taught the language since 1975 and was the head of the Lakota Studies Department at Sinte Gleska University on the Rosebud Indian Reservation. From early on he kept notes about his language, and created an orthography for it, and was the first Native Lakota speaker to publish a Lakota textbook and glossary. According to an Associated Press article, it is a language spoken by fewer than 6,000 people. 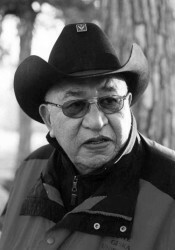 “Albert White Hat reverses the traditional method of explaining language by showing through examples, anecdotes and lessons the world view and values of the Brule Lakota, how people speak and think,” wrote the late Vine Deloria Jr. in the forward to White Hat’s 1999 book Reading and Writing the Lakota Language. “I’m one of the few who didn’t get into a boarding school system ‘til I was 16,” White Hat explained in a Youtube video about residential school. He expressed the anger he felt about how much was taken away from his people by the government and church. Emerging from residential school, he sought out people who had gone “underground” in the 1930s and ‘40s to preserve Lakota ceremonies outlawed by the government, and joined in. “I started to find what I was happy in the most, and that was the language,” he said in a Cowboys and Indians magazine article. But as he faced the lightening sky and saw the morning star, he realized he wanted to live and be happy, that he deserved to experience the good life. He hopes White Hat’s legacy lives on and that more young people will decide to study the language and work to retain its importance. White Hat, whose Lakota name was Natan Tokahe (The First One to Charge) was well known all over the powwow circuit, and was a spiritual leader, as well as a language teacher. He was Sicangu (Rosebud) Lakota, and was born on the outskirts of Saint Francis, South Dakota to parents Joseph and Emily Hollow Horn Bear White Hat. He spoke only Lakota until the age of seven, when he began classes in Spring Creek and then graduated from St. Francis Jesuit Mission School. “I came out of there totally ashamed of who I am, of what I am,” he said in a video. “I grew up with a lot of the older people, listened to the stories. And those stories were inside of me.” Boarding school killed those stories, he said. White Hat was gratified to see Plain Indians stories preserved in fully-illustrated books like The Boy and His Mud Horses by Paul Goble, for which he wrote the forward. Emily White Hat said her father believed in sharing the Lakota way of life with both tribal members and non-Native Americans. He believed “there was always an opportunity to educate. Even though some questions may be off the wall, he believed it was better to take the opportunity than to be misled about who we are,” she said. Dr. Archie Beauvais, director of the Lakota Language Preservation Project for the Rosebud Sioux Tribe, taught at Sinte Gleska with White Hat for more than 20 years. He also had the honour of reviewing White Hat’s draft of his first book on the Lakota language. Jacqui White Hat, another of Albert’s daughters, posted a letter on Facebook that she received from James Michael Raphel, who described the time he knew White Hat. White Hat had prostate cancer and other health issues, according to family and friends. He had seven children and many grandchildren.